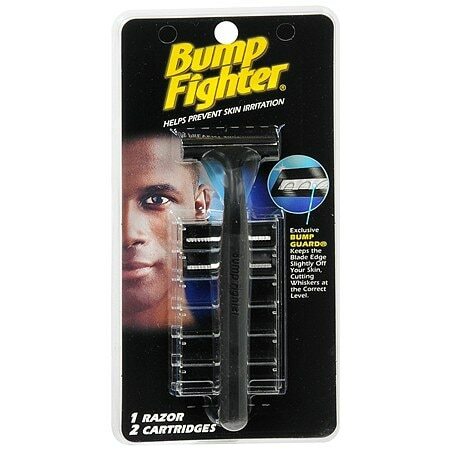 Bump Fighter Disposable Razor...4 ea. Exclusive Bump Guard keeps the blade edge slightly off your skin, cutting whiskers at the correct level. 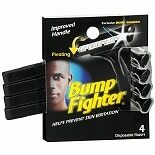 The Bump Fighter Shaving System was created especially for the African American male who suffers from sensitive skin. The Bump Fighter Razor is designed with a contoured handle that has a unique rubberized grip for a safer, more comfortable shave. Bump Fighter Razors are specially designed for use with Bump Fighter Cartridges, with exclusive Bump Guard technology that keeps the blade edge slightly off your skin. This allows the blade to shave at precisely the right level to minimize skin irritation. For maximum results, use regularly with Bump Fighter skin-care products, such as Bump Fighter Shaving Gel, Bump Fighter After Shave Skin Conditioner and Bump Fighter Treatment Mask. Razor handle made in Taiwan. For first use, slide blank cartridge off of handle. Hold dispenser so the latch is at the top. Slide handle into new cartridge and lift gently to release cartridge from dispenser. To replace cartridge, press used cartridge into empty chamber in dispenser and slide handle to remove. © 2010 American Safety Razor Co.